Sometimes I need a little taste of Summer. Here in Wyoming we are still in the dead of winter. I know that the first day of spring is just around the corner, but I am not sure Mother Nature has gotten the memo. I am one of the few who enjoys the continuous snow, the cold mornings, the frost on the car windows. I will stop now. It is getting close to calving and we need a little warm weather. So I will appreciate a little rise on the thermometer. Every now and then, when the wind is howling and the snow is still blowing, I get a craving for a little piece of summer. You know that dish that will remind you that warm weather is not so far away. Well last week I was browsing through my recipe program and came across an all time favorite. I couldn’t resist. I had to make it. My husband had been complaining that I we did not have any lettuce or fresh veggies. So the next time I was in town I purchased all the ingredients to whip up this summer time salad. It is so fun to put together and even prettier to look at. But the taste, is amazing. Everything just mixed together to make a fabulous dish. Let me say that my husband and I devoured this salad. So run to the store and whip this baby up. You won’t regret it. You can almost feel summer when you bite into this salad. Mix together mayo, salad dressing, milk, dry mustard, salt and pepper. 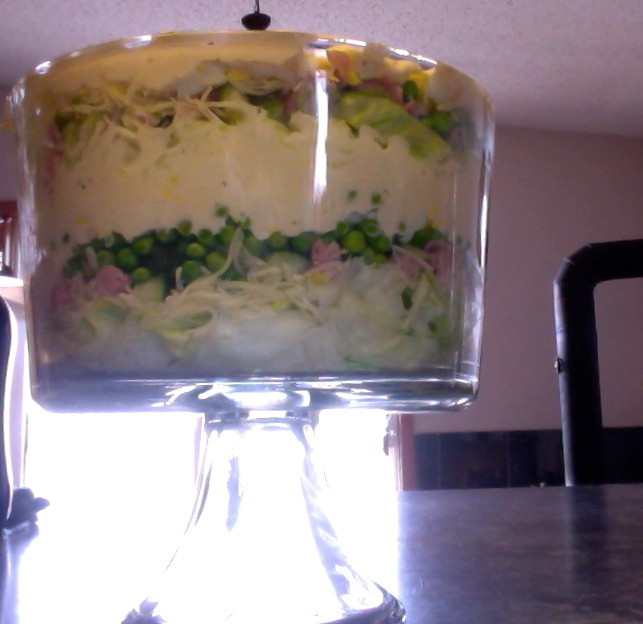 In a large bowl or 13×9 inch pan layer 1/2 lettuce, and 1/2 of the cheese, peas, eggs, turkey or bacon. Spread 1/2 of the mayo mixture. Repeat layers. Cover and chill 8 hours. You know sometimes when you are getting hungry, you yearn for something from home. Or maybe it is when you yearn for home you get a little hungry. Either way memories and food seem to go hand in hand. I’ve noticed for myself that when I am especially homesick for Tennessee that is when I crave my mom’s cooking the most. I want those smells to linger in my house. I want to taste the food and savor that memory of the last time I had this in my mom’s kitchen. I bet we all have those certain recipes that just take us home. No matter where we are in the world, or where we are in life, we can smell that aroma or taste that food and we are back with in our childhood homes enjoying home. Well that is what I believe this recipe is for my husband and his sisters. For several years we would celebrate Thanksgiving down in gorgeous Craig, Colorado. Erica, my husband’s middle sister, lived in spectacular cabin placed on the hillside. Just being there over the holiday made you feel like you were in a movie. The crisp air, the cabin atmosphere, and the food. Oh my the food. After Thanksgiving, my husband’s younger sister would whip up their mom’s taco salad. This recipe makes a ton. The girls would go shopping early in the morning and come home to this for lunch. It will fill you up and hit the spot. Let me just say I have never settled for just one bowl. I always seem to over stuff my self again on Friday, rather than giving my gullet a break. 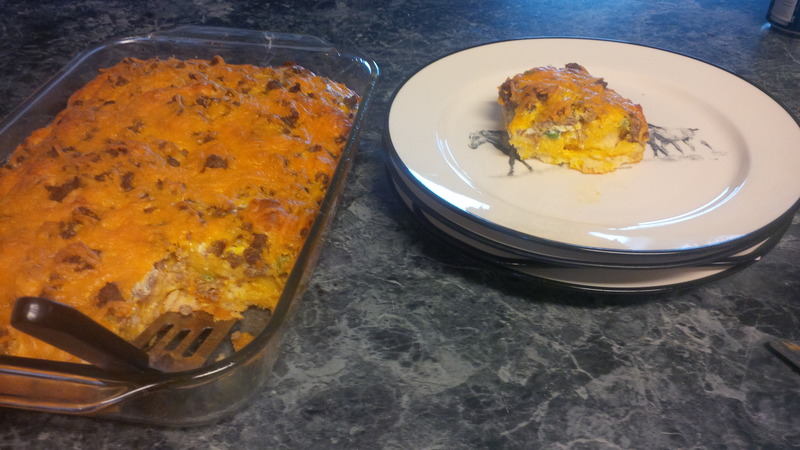 Today my husband asked me to make this recipe for our day tomorrow gathering cows on the mountain. It is a long day and this salad will be a great meal. (Although my son, who is the pickiest eater in the free world, will have none and a PBJ will be calling his name.) This was a meal from my understanding their mom would make up for large crowds and for cow work. Cook the hamburger meat and drain. Add salt and pepper. Remove from pan and allow to cool. Mix together mayo and taco seasoning. Once the meat is cool add the mayo mixture and mix well. Add the beans, lettuce, onion, cheese, to the meat mixture. Stir to combine. Crush up the Doritos and add to the salad just before serving. This is my 2nd bowl. I was trying to downsize and only have a 1/2 cup of mix before I added my chips. That makes a second bowl better right? Notes: I have used pepper jack cheese and it was great. Also I don’t add the chips because it makes soggy leftovers. Instead I place the crushed chips in a large serving bowl and let guests add them to their bowls. There is always leftovers and it keeps it crunchy. I like it better, it’s a texture thing for me I think.